JOYNORMOUS PRICES not to be missed with CADBURY TRADE WEEK 23-29 NOV 2015, CDM Block PM £1 17x95g £9.49, CDM Oreo 36x41g £10.99! Many more offers in-depot! Exclusive Offers from 16-22 2015 November only! Milkybar Blocks PM £1 12x100g £5.99, Smarties 48x36g £11.99 & Carnation Evap Milk PM 99p 12x410g £6.49! WIGIG! 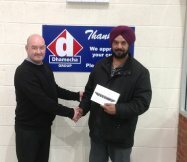 CONGRATULATIONS TO OUR LUCKY SECOND PRIZE DRAW WINNER: SINGH SUPERSTORE of VENTNOR STREET LEICESTER Who WON an iPAD Mini! Raffle prize to be Won Everyday for Your Chance to Win; Visit Dhamecha Leicester Now!